Home » Computing » Archive by category "Programming"
For those who do not know, Minetest is an open-source free-to-play and free-to-modify alternative to Minecraft. It’s Free as in Freedom – and as in Free Lunch. For the past few days I had been running a Minetest server – it was fun whilst it lasted, but I have been extremely busy with work and it turns out I need to liberate that server node for something more productive… so for now, Bite Me, and its villages, are defunct. Originally the idea was to run a Minetest server with a difference – during the week, an easy setup would have allowed players to create whatever they wanted in the world; settle villages and such, without any aggressive mobs or PvP. On Friday nights however the world would be backed up, and NSSM would be turned on, PvP would be enabled, and random protector blocks would be deleted. On Monday, the world would be reverted to its state as registered on Friday. I did keep a backup of the world data though, and all tools I had written to monitor and manage the server. It’ll be back online some day, but with a little bit more pre-prep; I’ll post some of the tools on my github page eventually, including the items allowing swithcing between the week-day safe mode, and the week-end massacre mode…..
For those of you who are curious about stats and requirements, I was running this on a Ubuntu 16.04 server with 512 MB RAM and 1 GB swap, 20 GB storage (more than enough) and a single CPU at 2.3 GHz, courtesy of digitalOcean. At peak, I think I had about 10 players all playing simultaneously, with a good few off exploring different caves and causing the map gen to work in several locations siultaneously, and the server was handling fairly well I believe. I expect if you want to run a properly specced server, 2GB RAM, 2 CPUs and 2GB swap would be a better bet. I might use that in future. The pictured snippet is probably one of the dirtier pieces of code I have had the misfortune of needing – and not being able to refactor to anything cleaner. I am trying to make bash my main programming language, and to this goal I have created a number of tools to aid me on my way: a library of code snippets that anybody can re-use, a packing tool to create executables, a pre-compilation tool to add compiler directives to bash, a build tool to pull all these together, and a make/release tool to manage versions. And I’m not yet done. Of the main efforts here is the library of scriptlets. Once of the main attractions of one language over the other is the availability of a large amount of re-usable code released as libraries and which are, pretty much, taken for granted. bash has none of this. And quite a few quirks. You have to contend with the very string-y way of passing data around (arrays are a bit of a nightmare until you get used to the arcane notations), and nearly every non-trivial operation you want to do is a command, an external process. But that is also exactly what makes so appealing – any language, and its associated libraries, can become your library! For starters, python, perl and PHP can all be leveraged for their respective strengths in specific situations, and it is possible to write and store additional scripts such as long MySQL tasks in their own files. Use a perl script to write change on the fly, and pipe to MySQL. It looks quite awful at first glance, but consider the power of perl to perform text processing, keeping your mysql files ordered in a directory-based hierarchy, and passing the result to PHP which will handle outputting XML much more ergonomically than PHP. 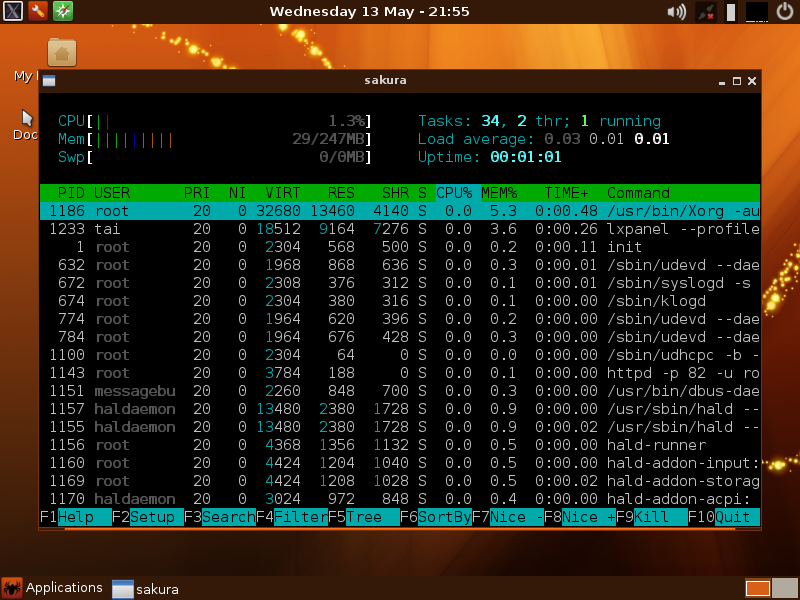 So whilst bash does have its odd and at times even infuriating quirks, I am learning to love it. 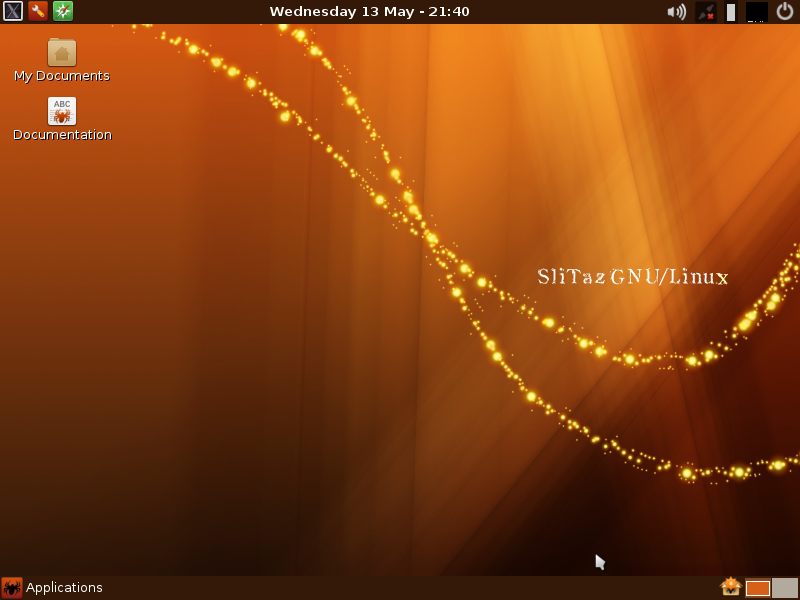 Recently I’ve been playing with SliTaz GNU/Linux, a tiny distro that can be made to operate even the oldest of PCs! 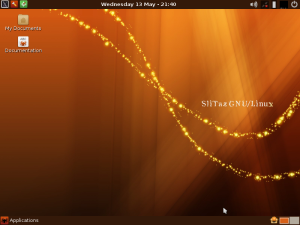 SliTaz is an independant GNU/Linux distribution, with its own package manager, repositories and kernel, focused on providing an OS for embedded devices and computers with extremely small amounts of power and storage. It is extremely lightweight: its standard ISO is about 35 MiB in size, botting from cold to desktop in as fast as 15 seconds, and ab initio takes up 32 MiB RAM with the Gtk openbox desktop and no extra applications. such uses where slick features are shunned in favour of lightness and efficiency. A GUI desktop environment is provided for those who are afraid of being in full-on command line mode, but to maintain its lightness, there are no traces of such heavy packages as LibreOffice or Firefox. and apart from that, not excessively more. That’s all you really need. There is even an Raspberry Pi version of SliTaz available to squeeze the most performance out of your Pi. On the LiveCD, to configure SliTaz, boot into the “Gtk” version; then open the web browser go to http://tazpanel:82 and enter the root login details. By default, the user is “root” and the password is “root”. Once in TazPanel, you can manage the system, upgrade packages, install new software – an more! For the purposes of this guide, we are just going to do a very simple install. If you’re comfortable with partitioning, go wild. You will be offered the opoortunity to launch GParted – click that button. You will be shown a map of the first hard drive. If you have multiple hard drives, BE CAREFUL with which one you choose – the operation we are about to perform will erase the disk you operate on. Choose the disk in the disk chooser menu in the top right – probably /dev/sda if you have only one disk. Again CHOOSE WISELY. Leave the defaults and hit OK, then click the Apply button to apply the changes. At this point the disk is erased and a new partition is set up. You have been warned! Most options should be fairly self explanatory. Set the host name to whatever you want. Change the root password to something sensible. Set the default user as desired. Click “Proceed to SliTaz installation”. After a few seconds… SliTaz is installed. Reboot! You’ll have to set up your locale and keyboard just once more and voila, a desktop Linux that boots in seconds! Here’s the simple recipe for installing SliTaz from the command line. Note that even if started from the LiveCD headless, this install will install a full GUI and take up around 100MB of space. The first thing to know is that the installer is invoked by the command tazinst. The second thing to know is that you need to create a configuration file for it. The third thing you need to know is that you need to partition your disk first. Naturally, this is what we’ll do first. Type these keys in order to erase /dev/sda and set up a single partition. If you have never done this before…. read up on partitioning with fdisk. It’s a whole topic on its own! Hit return for each new line of course. 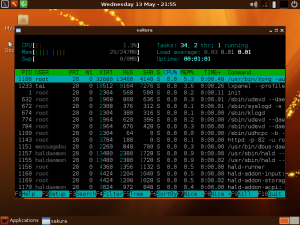 Great, you have a new partition on /dev/sda1. Now create the config file. Once you have created the configuration file, edit it. TGT_GRUB – “yes” unless you intend on installing Grub manually afterwards. After a few second, the install will be finished and you can reboot. Now you can install multiple packages from one line….! I finally got around to putting together some initial code for that thing I wanted – a script to detect changes in a page and produce an RSS entry as an outcome. “watcher-rss” is just that – a simple script that can be called by cron to check a page for a significant area, and generate an RSS “feed” in response. Following a mishap with a backup some time ago in which I lost the contents of my text clippings, I have started investigating resource fork detection for my rsync pre-processor. The pre-processor will eventually be python-based, with a couple of extra scripts for platform-specific operations that arise. I need it to be able to backup using rsync or some Windows backup program with equivalent functions, to a FAT32 target, without any data loss. From the restoration side, re-building the chunks and unpacking the tar’d files need to be handled. echo "RSRC present on $MYFILE"
echo "RSRC absent from $MYFILE"
What is MTP (Media Transfer Protocol)? How can I manage files on my media device by simply copying files? How do I manage a MTP USB device through the file manager on Linux? How do I use jmptfs? So… I’ve just gone and bought a little Sony Walkman Series B and was looking forward to trying it out on my Xubuntu 14.04 install with Clementine. The Walkman Series B comes with an integrated USB connector for transfer and recharging, which I plugged into a USB 3.0 port. Alas, rather than using a common interface such as the block file system, the device uses the Media Transfer Protocol only interface. Problem #1 – after double-clicking the desktop icon, it took a few seconds to mount, during which I double-clicked it again (thinking my taps on the touchpad may have been too light…) and was presented with a “could not mount” error. Ouch. But it mounted after that. Problem #2 – it was not mounted as a block device (read: regular hard disk) but as a MTP transfer. Maybe it’s Thunar, or maybe it’s an inherent limitation in the protocol, but this did not allow me to move/add/delete files at all. Problem #3 – After firing up Clementine, it seems the device was detected as practically full. I had a number of Clementine crashes over my various attempts at copying files from my library over as well. Ghastly procedure. to unmount the device. I might make a Zenity script and a .desktop entry to make it even easier to manage should I have to add this to a user’s configuration. About that: getting out of walled gardens by using Blockchain? ReadWrite is runnning a piece touting Blockchain as the panacea to solving the problem of Walled Gardens (because these in themselves are somehow stifling innovation). Blockchain is a protocol that ensures identification and integreity of a piece of data and its iteration in time. Apps are created and delivered in a walled garden. Where’s the connection? The idea is that we want to develop apps that can leverage the power of “App+Could” type systems – that is, having an app that accesses your data online – without seeing your data being siloed into that company’s server forever more. For example, a notepad app, with lots of your notes in it, accessible from all of your devices (desktop, laptop, tablet, phone, watch, fridge [hey, you might have a shopping list note]). Your data is stored somewhere online, on some company’s cloud infrastructure, and all these apps query that company’s server. Now if your data is in a peer-to-peer store, using a blockchain-encoded transaction to modify it, then its data is also distributed around the Internet, with changes in the data recognized and stored by the network. I guess the goal is to move the data to a truly disembodied cloud, and not just pigeon holes. So you change a line in your shopping list on your fridge. The entire network validates this, changes the corresponding peered data, and that change is spread, verifying against the blockchain for the latest status. Your data is stored peer to peer, potentially anonymized and encrypted (ha! ), and is resilient to deletion. However we still have walled gardens where the actual apps have restrictions on their on-device functionality, and we cann’t necessarily control what servers they actually talk to. The reason apps are more interesting than mobile browsers is the interaction with the hardware on the device. So it’s an interesting start, but so long as there are practical advantages of using an app, we won’t escaped walled gardens on mobile devices. In the mean time, if you’re really concerned about walling, try open source, try full computers, and try the real world. We’re all over here making stuff. Innovating freely. About that: why are we still writing programs using text-based languages? Programming is a fairly specialist activity, requiring a different manner of thinking to operate in. Some programming languages try to be friendly in terms of words, symbols and grammar used to write the code (syntax) – but it still tends to be an initial hurdle to get past. Of interest on this topic, a thoughtful look at some of the ways that visual programming is often talked about. For the TL/DR: graphical programming is inefficient, and error prone; better methods of viewing source code during read-back is more interesting. After being led to the Ada Programming Language Wikipedia entry (and being impressed by what it offers and promises – it is designed for fail-safeness and robustness, and as such is used in satellites, military jets and orbital satellites), I wondered, why isn’t the language more popular, like the less effective and more error-prone C and C++ which are used for coding our operating systems, or Java/PHP/Ruby which power our interwebz? A few forum posts exist about this, and numerous explanations abound, from petty whining (“everybody who tries it it hates it”) to accusatory (“it’s designed by a committee, and like Esperanto, nobody wants to use that”) through conspiracy theory (“it’s in the interests of repair & diagnostic/IDE vendors to make sure crappy languages persist”) and even via circular reasoning (“it’s not gained popularity because other languages are more in demand”). I kid you not. In all of that, I only once noted one answer which hit a sensible mark: in a time when there wasn’t a prominent single language, due to the closedness of computer systems, hobbyists could only work with what was lying around, and there was no global applicability in any real sense [citation needed…], C came along and offered what nobody else was: a high-level language for low-level computing, a free compiler, and an operating system to use it on, in an ecosystem that promoted (at the time) code sharing. It was this seed traction that led to C being still the most popular language for system programming today. Other languages have since risen, but the most popular, with the largest communities, still are application-level and web-oriented – not system level. In the midst of this, Ada still retains (bless or curse) its original image as the brainchild of the US Department of Defense’s brainchild, with little push to make it a business-systems or high-availability systems contender. The onus then is on the existing Ada community to start building tools and libraries for newcomers to use. Newcomers like to feel invited in by pioneers.